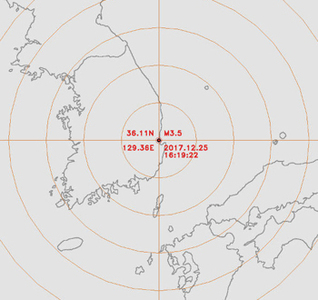 A 4.1-scale tremor occurred 50 km off the coast of Pohang in southeastern Korea at 12:53 p.m. Sunday, sending nervous residents out of their homes and into the streets. There were no reports of damage. Sunday's earthquake was felt in most of South Gyeongsang Province. The National Fire Agency received reports as far north as Daegu. 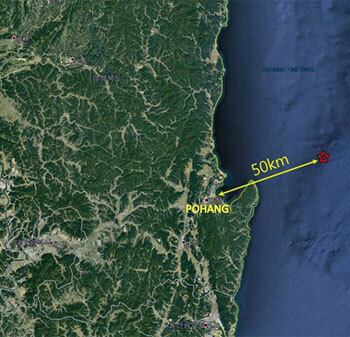 Pohang residents appeared to have grown used to tremors. The last time a sizeable tremor rocked the port city was when a 4.6-scale quake occurred 5 km to the northwest in February 2018. The southeastern port city was shaken by around 100 aftershocks after a 5.4 tremor in November 2017. Im Kyoung-won (56), saw bookshelves collapse in his home during the quake in 2017, but on Sunday he said, "My family and I felt the ground shake a bit while we were eating, but nobody ran for cover." Pohang city officials held an emergency meeting but concluded that the quake occurred off the coast and was not intense enough to trigger concerns. They said earthquakes have occurred an average of 4.6 times every year off the coast of North Gyeongsang Province over the last 10 years and have the effect of easing geological stress, thus reducing the risk of a major quake. But seismologists cautioned against growing too jaded. A total of 14 earthquakes measuring more than 4 on the Richter scale have shaken Korea since 2009, eight of them occurred off the coast of Pohang, Gyeongju and Ulsan.